Chelsea striker Olivier Giroud – who recently steadfastly supported Mo Salah after some Chelsea fans were filmed chanting Islamophobic and racist abuse at Mo Salah – has given his opinion on the outcome of the huge Anfield meeting this Sunday. Less admirably, the France forward believes that teammate Eden Hazard should win the Player of the Year award ahead of favourite Virgil van Dijk, according to Goal. “I would say Eden Hazard [should win it]. I think I cannot say [who I voted for], I would vote for Eden Hazard [if I could],” claimed Giroud. But it’s Van Dijk who will be up against both the Frenchman and the Belgian on Sunday, with three vital points up for grabs to fuel our precious title challenge. The 31-year-old seems confident that he can come out on top in Sunday’s league meeting against the Dutch collosus. “I played against Van Dijk personally a few times and it has always been a tough position because he is very good and very strong, but I’ve scored a few goals playing against his teams,” he stated. “I won last year and scored at Stamford Bridge and scored the winner at the Stade de France against the Netherlands a few months ago. We don’t have to be scared and no matter who plays we will be 100 per cent focused on winning the game. “They will have to win for sure to stay in the title race but we need a good result as well to keep our chance for the Champions League race so it will be an interesting game, a very tough game but we have shown in the past and the first game at home that we can compete with them and match them. “So, we need to go there and start on the front foot and believe in our qualities and game. Giroud started on Thursday as Chelsea eventually managed a win after labouring against Slavia Prague in the Europa League. It was prior to that match that a group of Chelsea fans were filmed targeting Mo Salah with Islamophobic chants. 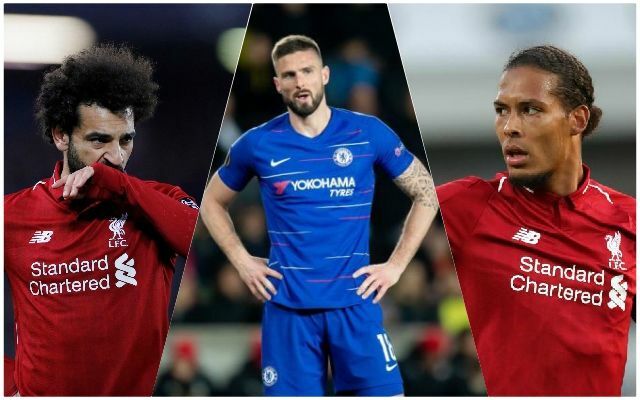 “It’s stupid to do that and I think Salah is strong enough to ignore them and we need to move forward and leave these people on the side,” Giroud declared. While we obviously completely agree with Giroud’s comments about those disgraceful Chelsea fans, his comments about Van Dijk are much harder to get behind.